Not even intermittent rain or name calling could stop or deter them. 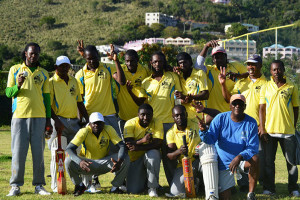 Under The Tree literally got up from sitting under the Tamarind tree on the Greenland field, to flog Road Town Wholesale by eight wickets during their debut in the BVI Cricket Association Digicel Twenty 20 league. Batting first, Road Town Wholesale had no answer to the spin of Bryan Daley who struck in the very first over and finished with 5 for 25, to bundle out RTW for a paltry 72. Sanjay Rambarock top scored with 17 and Kevin Dolley chipped in with 3 wickets. In reply the Under The Tree lost two early wickets, but were guided over the finish line by Phillip Jacobs, who scored an unbeaten 33 including one six and six fours, to win by 8 wickets. The opening game saw Turby Xavier bowling Vincy into a strong position as he took three wickets cheaply in restricting the New Testament Church of God to 122-7. Cameron Williams top scored for the Church with 85, but received little support from the rest of the batting line up. Despite the loss of two wickets Vincy got off to a winning start and were steered home by Kenrick Leslie, who finished unbeaten on 41. Action continues on Sunday with the Royal Knights facing the Seven Day Adventists at 10.00am and then at 2:00 p.m. the Wolues will meet the returning Police squad.